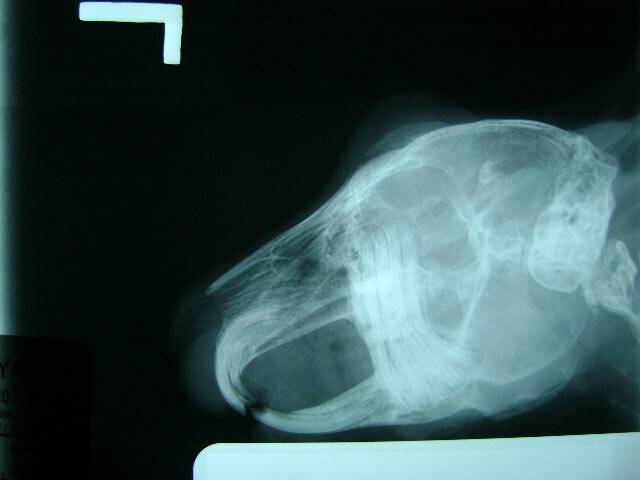 Dental abscesses are common in rabbits and treatment of these abscesses can be challenging. Abscesses can be detected as a hard lump or swelling typically on either the maxilla (cheek) or the mandible (jaw). Less commonly it can be found in locations such as behind the eye, in the neck or in the sinuses which can carry a poorer prognosis. Rabbits affected by abscesses are usually subdued and not eating well. Some may present with a fever and have more systemic signs such as gastrointestinal stasis (decreased bowel movements). Some owners realize there is a problem when there is a strong odor coming from the rabbit’s mouth or facial area. The rabbit’s symptoms vary based on how long the problem has persisted before the owner notices the signs of illnesses. 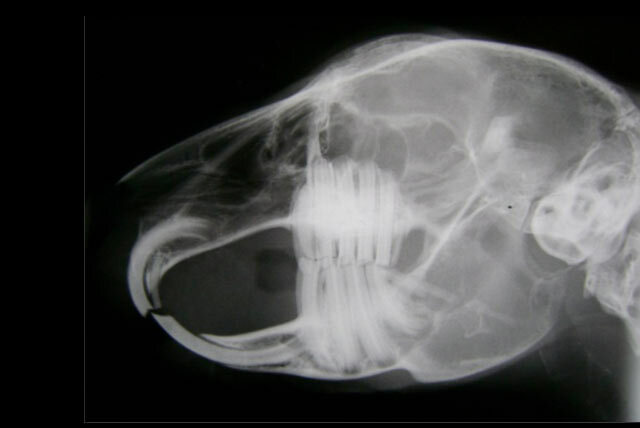 Pathogenesis: Why do rabbits develop dental abscesses? Rabbits have unique teeth that are open-rooted, which means they grow continuously throughout their lives. Inadequate chewing on tough fibrous vegetation such as hay and leafy vegetables can lead to abnormal wear leading to tooth root elongation, malocclusion, dental spurs, food impaction or deformed/crooked teeth. These abnormalities in turn predispose them to infection and pus may develop in the roots of the teeth thus forming dental abscesses. A diagnosis of dental abscesses and dental disease is made based on three diagnostic criteria: a physical examination, an endoscopy guided oral exam under sedation and radiographs (x-rays) of the skull. The treatment of rabbit abscesses is difficult because rabbits produce thick or caseous pus that is difficult to drain. As a result, the pus generally causes deep infections that need to be thoroughly cleaned down to the underlying bone. This process can be broadly divided into intra-oral and extra-oral components. Intra-oral: To start, a complete endoscopic oral exam is carried out. Inspection of the oral cavity is performed to locate the drainage point of the abscess. The spaces between teeth (periodontal pockets) are probed for signs of periodontitis. Pus surrounding a tooth or increased laxity (looseness) of a tooth would indicate that extraction of the tooth is necessary. Molar spurs (sharp points) are removed with a high speed hand drill. Teeth that are crooked or too tall are also reduced in height in a process called crown reduction. Extra-oral: After completion of the intra-oral dental work, the abscess is then addressed. Oftentimes the abscess is most easily accessible from the outside, through the skin. Using a scalpel, the abscess is lanced and thoroughly drained. Any non-living unhealthy tissue associated with the abscess is excised. It is also recommended that a gram stain and culture swab be taken at the time of surgery. A gram stain is a microscopic examination of the bacteria in our laboratory that gives broad information of likely types of bacteria present in the abscess. A culture swab is also sent off to an external laboratory that identifies the specific bacteria growing in the abscess site and allows for selection of the most effective antibiotics. Cultures typically take 5-7 days to be processed. In the first method, the surgery site is left open in a technique called marsupialization. Sutures are placed to keep the wound from closing. The wound is flushed with a disinfectant once daily by the owner for a period of up to 2 weeks. Any residual debris or infection not cleared with the initial procedure is removed by the flushing. A weekly recheck is performed for a thorough cleansing until the wound heals. The sutures are then removed and the wound is allowed to close. The second method to manage the abscess site is by a wound packing technique. After the surgery, the abscess site is packed with sterile packing material that has been soaked with antibiotic and the skin is partially closed. The owner needs to make sure the rabbit leaves the tape and surgical site intact but no flushing is needed at home. Once weekly the rabbit is rechecked and the gauze is removed and replaced until the wound is healed. Post-operative care: What happens after surgery? 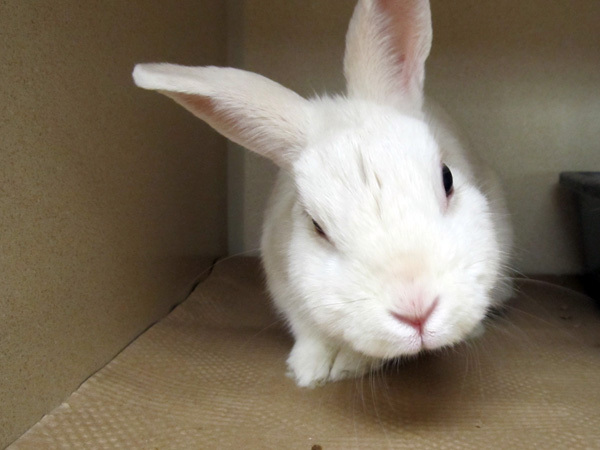 Rabbits are typically kept in the hospital for a few days post-operatively to allow for close monitoring, continual pain management and supportive care. Appropriate long- term antibiotic therapy is key to successful treatment of dental abscesses. Previous studies have shown that rabbit abscesses contain a lot of anaerobic bacteria. Anaerobic bacteria are bacteria that do not require oxygen to grow and incidentally are also very difficult to eradicate. Choosing appropriate rabbit- safe antibiotics that are targeted for anaerobic infections is very important. Some choices of antibiotics include drugs such as azithromycin, penicillin G injections, chloramphenicol and combinations of enrofloxacin and metronidazole. The culture results will guide the selection of the best choice of antibiotics. Rabbits are also placed on anti-inflammatory and pain medications post-surgery. The healing time for these abscess surgeries typically range from 3-6 weeks. Owners generally continue treating their pets at home by giving syringe feedings, oral medications and cleaning the surgical wound if necessary until their pet is completely better. Whilst both care at the time of surgery and appropriate post-operative management minimizes the likelihood of complications, unfortunately a perfect outcome cannot be guaranteed in every case. Possible complications include anorexia and gastrointestinal stasis post-surgery due to pain and discomfort, poor or delayed healing of the surgery site, and resistant infections that do not respond to antibiotics. Infections that are left untreated for prolonged periods can also lead to osteomyelitis, which is deep infection of the bone. Prevention is always preferable to treatment! Continual wear of the teeth by chewing on fibrous material is very important to prevent dental disease. Rabbits should be allowed to free-graze grass hay such as timothy as well as be offered a generous serving of dark green leafy vegetables once or twice daily. Genetics also play a role in dental health and some rabbits demonstrate a predisposition for dental disease. A thorough physical and oral exam annually is recommended for early detection of emerging problems. Some rabbits require dietary modification or minor dental work to prevent progression to dental abscesses.